Not surprisingly, Into the Light, David Coverdale’s first official solo album in over 20 years sounds pretty similar to Restless Heart, the Whitesnake album that came out three years prior to this release. Restless Heart was originally intended to be a solo release but the record company interfered (as they are prone to do) and released it under the name “David Coverdale & Whitesnake”. Of course, the Whitesnake name was featured prominently on that album’s cover. Well, Mr. Coverdale finally get his way and full solo credit on this release from mystery label Dragonshead. I see many listings online claiming this album was released by EMI but I don’t see their name anywhere in the credits and I can’t find anything about Dragonshead online. Coverdale’s vanity label? 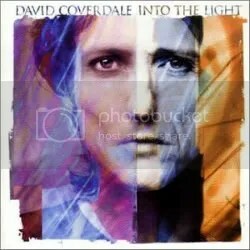 Anyway, Into the Light continues Coverdale’s journey back to his roots and there’s a few bluesy rockers and ballads on here that would sit comfortably on any early Whitesnake release like “River Song”, “She Give Me”, “Cry For Love” and ‘Living On Love”. “Don’t Lie To Me” is the hardest rocker of the bunch that seems to pull together all eras of Whitesnake, much like the entire Good to Be Bad album did. Alongside the bluesy numbers is also a collection of fairly mellow melodic rock/pop numbers which don’t really intrigue me all that much but apparently this whole album was very cathartic for Coverdale who was still trying to find himself after allowing himself and Whitesnake to fall into the “hair metal” image in that was so popular in the late ’80s. For some reason, Coverdale likes to cover his own material (to his credit, he did it quite successfully). He does it again here with a new version of “Too Many Tears”, which is just a slower version of an already slow song… which was released on Restless Heart only THREE YEARS earlier. Given the even slower tempo, Coverdale voice is restrained and the song just doesn’t work as well. Why even bother? I do have to say that “Wherever You May Go” is a fantastic ballad, one of the best I’ve heard from Coverdale. I remember this album coming out in 2000 and had heard this song online and loved it, but didn’t buy the album. I guess I was afraid the whole album would be too mellow for me but this song that constant play on my computer back in those glorious Napster days. The final word on Into the Light is that it’s a decent album. Anyone who liked Restless Heart will probably like this but there’s a few mellow moments on here I could have done without.